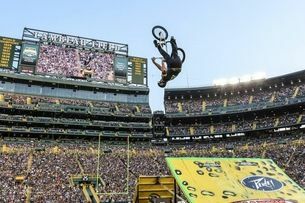 Peavey Electronics' new partnership with King BMX Stunt Show will make it the audio supplier for the show. Founded by former X Games participant Keith King, King BMX Stunt Show is one of the world's most successful long running BMX entertainment companies. Whether performing during such high profile events as Monday Night Football, the NBA playoffs, or a myriad of festivals, fairs, churches, and corporate events, the Stunt Show relies on Peavey audio equipment for every show. "Music is a key component to what we do, and we have carried the Peavey brand along with us to every single show for nearly eight years," King said. "Music provides the backdrop to our shows. It pumps up the crowd and also fuels the riders. Every single sound and music component of our production is powered by Peavey." The King BMX Stunt Show utilizes a fleet of Peavey gear to pull off each performance, including several compact, feature-rich PV 8 USB mixers and PVXp 15 speakers, as well as a 100-channel, true diversity Pro Comm PCX U-1002 Handheld Wireless System. The rig rounds out with Peavey cables, stands, and other accessories. Peavey also gives away a guitar at each contest stop of the Trans Jam BMX Contest Series, a BMX competition that King also operates. "A show of this caliber deserves durable and great sounding audio gear," shared Peavey's general manager of business development, Tony Moscal. "We are proud to support the talented riders of the King BMX Stunt Show."